OK, tomorrow afternoon at 2pm a group of men from the church will be jumping from a perfectly good plane to skydive in Palatka. I'm planning on making the jump. I guess reading "Wild at Heart" finally has gotten to me. If you see me Sunday, you'll know how it turned out. I'm preparing my Bible study for tonight. This week I'm talking about Joseph and how his brothers sold him into slavery. This story of Joseph and his coat of many colors is widely known and is a children's Sunday School favorite. I've read it over and over. Today, I was reminded that regardless of the trouble that seems to come in life, and sometimes it's significant, God is still soveriegn. Every step that led to Joseph finding his brothers, making them mad, being saved by Reuben, being sold to the Ishmaelites and eventually to the Egyptian leader Potipher was in God's plan. Amazing. God is always in control. . .even when we can't see it. Read it yourself. Start in Genesis 36 and immerse yourself in this story. You may find yourself in it. 18. PLAN TO BE SPONTANEOUS TOMORROW. 19. ALWAYS TRY TO BE MODEST, AND BE PROUD OF IT! 20. IF YOU THINK NOBODY CARES, TRY MISSING A COUPLE OF PAYMENTS. 21. HOW MANY OF YOU BELIEVE IN PSYCHO-KINESIS? RAISE MY HAND. 24. OK, SO WHAT'S THE SPEED OF DARK? 25. HOW DO YOU TELL WHEN YOU'RE OUT OF INVISIBLE INK? 26. IF EVERYTHING SEEMS TO BE GOING WELL, YOU HAVE OBVIOUSLY OVERLOOKED SOMETHING. 27. WHEN EVERYTHING IS COMING YOUR WAY, YOU'RE IN THE WRONG LANE. 28. HARD WORK PAYS OFF IN THE FUTURE. LAZINESS PAYS OFF NOW. 29. EVERYONE HAS A PHOTOGRAPHIC MEMORY. SOME JUST DO NOT HAVE FILM. 30. IF BARBIE IS SO POPULAR, WHY DO YOU HAVE TO BUY HER FRIENDS? 31. HOW MUCH DEEPER WOULD THE OCEAN BE WITHOUT SPONGES? 32. EAGLES MAY SOAR, BUT WEASELS DO NOT GET SUCKED INTO JET ENGINES. 33. WHAT HAPPENS IF YOU GET SCARED HALF TO DEATH TWICE? 34. I USED TO HAVE AN OPEN MIND BUT MY BRAINS KEPT FALLING OUT. 35. I COULDN'T REPAIR YOUR BRAKES, SO I MADE YOUR HORN LOUDER. 36. WHY DO PSYCHICS HAVE TO ASK YOU FOR YOUR NAME? 37. INSIDE EVERY OLDER PERSON IS A YOUNGER PERSON WONDERING WHAT HAPPENED. Not as deep as "My Utmost for His Highest," but it sure makes you think. Have a great day! 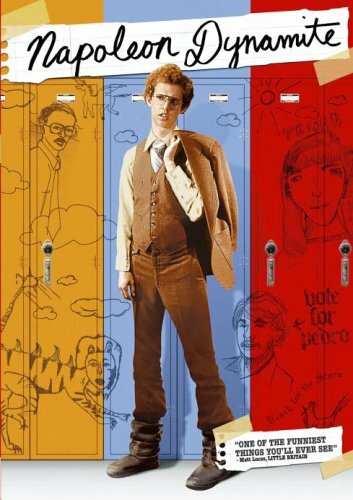 The movie "Napoleon Dynamite" has been out since 1994. I had not seen this movie, but was told by a number of teenagers that it was hilarious. Just a few weeks ago I was at practice with my younger soccer team (8, 9 & 10 year olds) and we were trying to come up with a name for the team. Then, one of the young girls said "Let's be the Ligers." All the kids went crazy saying "Yeah, the Ligers!" It was the only name they all agreed on. Now, you may be asking "What is a liger? "A liger is a cross between a lion and a tiger. (Not to be confused with a tigon, which is a cross between a tiger and a lion. Napoleon Dynamite references the liger in the movie. So, after naming the team the "Ligers" I decided to watch the film. I must say that this is one of the dumbest movies I've ever seen. However, for some reason, I laughed all the way through it. My wife let me know that she couldn't stand it. I took an informal survey of folks at church and discovered that no women like this movie. Actually, not many people my age like this movie. Hmmm. What does this say about me? Anyway, sometimes a dumb movie is a good thing. It's good to laugh. I discovered that every character in the film reminded me of someone I knew. That's not necessarily a compliment. So, if you need some mindless entertainment, go watch Napoleon Dynamite. If you want some great sports entertainment, come watch the Ligers play soccer. I'm up early this Saturday morning. In about an hour, I'll be coaching my kids' soccer teams. Right now, I'm reviewing some notes for our Battle Ready Men's Quest coming up in just a week or so. 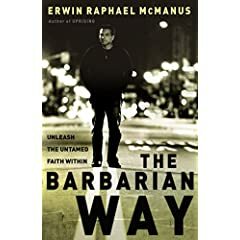 I'm reading The Barbarian Way by Erwin McManus. Whew! I need to read this every morning. God has set me and you in strategic locations in this world and at this time for a reason. Am I willing to not "play it safe." I'd better be. So, what does this mean? Actually nothing, other than that I do not pick winners well. Now, when it comes to women's basketball, I'm doing much better. Three of my Final Four teams are still dancing. I picked Tennessee (they could beat the men's team,) Florida (they lost the first game,) Michigan State, and Oklahoma. I have Tennessee winning it all. 1. Pat Summitt - she's the greatest coach in women's basketball history. She, in fact, has won more games than any other coach in collegiate history (men or women). And, she's mad. She is angry that the NCAA seeded the Lady Vols as a number 2 seed in their bracket. 2. Candace Parker - she's the only woman to slam dunk in a tournament game. She did it twice against Army. Now, these weren't Michael Jordan or LeBron James dunks, but nonetheless intimidating. 3. Shanna Zolman - an incredible player with a strong faith in Christ. Regardless of my picks, this has been an incredible basketball month - both for men's and women's teams. Here's hoping my women's tourney picks pan out. Go Lady Vols! When churches jumped on the "youth ministry" band wagon back in the 1970s, the purpose was to hire a youth pastor who could "keep the kids busy" and hopefully teach them some Bible lessons along the way. Then, as churches began to see the viability in a strong student ministry (most churches stopped calling it youth ministry about five years ago), seminaries began to offer degrees focused on student ministry. More changes came. Churches no longer had youth directors. They now hired Youth Ministers or Youth Pastors. Now, we have Student Pastors. All of a sudden churches were no longer content with just having a youth program. Between our church's youth pastor and me, we have over twenty years of student ministry experience. We've read all the books, have followed the student culture trends and have discovered that student ministry in the 21st century will have to look a lot different than what we grew up with. Youth Camps are not the big deal they once were. Service projects and mission trips are. Today's teenagers would rather be giving than receiving. They will serve if they believe the ministry or project is life changing and worthwhile. No longer are they content with just being "kept busy." "Coke & a joke" youth pastors do not grow disciples. This "Coke & a joke" term was first heard while we were in seminary. This references the student pastor that builds his entire ministry on his ability to make kids laugh and builds crowds by providing free soft drinks and pizza. While pizza parties and funny stories are good, the quality student pastors realize there's much more to ministry than this. Quality student ministries have three separate and integrated emphases: students, parents, and student leaders. If any of the three areas is weak, the entire ministry suffers. Success in student ministry is not graded by checking how many attended an event. Students see through the fluff. First impressions are important, but lasting impressions are key. Most churches do not actually have student ministries. They have adult ministries for students. Our church is experiencing some incredible "God moments" right now. We understand that our teenagers are not "the church of tomorrow." (BTW - this is a term that has always bothered me - David) They are the church of today! They have such great potential to make an impact in this world. Maybe more so than many of us as adults. In order to grow our student ministry into the healthiest, life-changing force in our community, we (Kip and David) have been meeting together to understand where God is leading us and to strategize. We know that just like other areas of the church, our student ministry is on a journey. To become the ministry God has called us to be is going to require some changes in how we view student ministry. Learning from past successes and failures and committing together to develop a disciple making, student-led ministry is our goal. About six years ago, our student ministry introduced a student growth concept with teams called Team Leaders and Imagineers. After talking through this, we believe it's time to re-introduce these teams. There are very few students ministries in our nation utilizing the gifts and abilities of the students in the ministry to their fullest potential. We are going to be one of those ministries. So, parents and students (grades 7-12,) on Wednesday, April 12 at 6:30pm, please make a point to be in attendance in the Student Center for a special "unveiling" of our new strategy for being a student-led ministry. Both of us (Kip and David) will be sharing and explaining the plan. You don't want to miss this. It will revolutionize the student ministry here at First Baptist.